1. Connect the playback device to a direct box and run a mic cable from the FOH position to the XR18 at the stage. 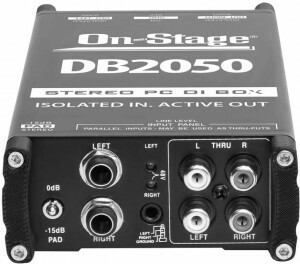 There are even some stereo-to-mono summing DI boxes (such as the Radial SB-5 or On Stage DB2050, pictured below) that are made for just this sort of thing. This would have worked, but I really liked the idea of a wireless solution, since I had just off-loaded my analog snake and wanted to eliminate the tripping hazard of any cables between the mixer and FOH mix position (where my laptop will be positioned). Plus, using a DI box would have eaten up one or two (if stereo) of my balanced XLR inputs on my XR18, and I sometimes need all of them. So ideally, I wanted to connect the playback device to the stereo 1/4″ Aux inputs on the XR18 instead of an XLR input. 2. Connect a device (CD player, iPod, etc.) directly to the XR18, hit play, and put it on loop/continuous playback. This would mean the music would constantly be playing, and I would simply have to mute/un-mute the Aux channels as needed using the mixer control software for the XR18. Since this solution would eliminate the cable between the FOH mix position and the stage, I preferred it over option 1. However, implementing this option meant I wouldn’t have any direct control over what music was being played at any given time, unless I walked to the stage to select a different title. 3. Buy a Bluetooth audio receiver and control the playback wirelessly from a smart phone, tablet, or laptop. There are many Bluetooth receivers on the market, so I looked at several. 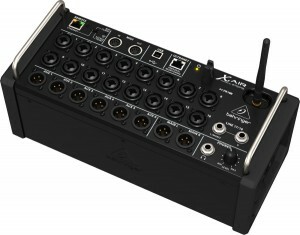 There were some aimed at the pro audio market (such as Alto Total Bluetooth) that conveniently plug directly into an XLR input, and can even be powered by the mixer’s phantom power. But again, in my case that would have eaten up one of my mic inputs, which I didn’t want to do. I ultimately chose a receiver like this one from HOSA, that includes a 1/8″ stereo TRS output, and I use a 1/8″ stereo to dual 1/4″ Y-cable to connect it to my XR18 stereo aux inputs. So far, it’s been working out great. This solution has proven to be a real convenience for me. I use it to stream audio from my phone almost any time I’m working in my studio. Whether I’m practicing my drums with a track through my in-ear monitors or playing music (or talk radio) through my floor wedges for some background noise, the sound is clear and free of any noise or interference. Using Bluetooth has also allowed me to pair the receiver with a variety of playback devices, so I always have a backup if the battery on my primary playback device (usually my phone) goes down. So if you’re looking for a remote music playback solution for the XR18 or any other wireless mixer or PA system, definitely give this a try. « Audio Technica ATM230–a New Standard in Tom Mics?